Let’s get down to brass tax, however, and go over a few points. Libya: Biden made the claim that the White House didn’t know that the Ambassador had wanted more security, which is unequivocally untrue. Pleas were made, and denied, and we’ve got a dead ambassador on our hands. Ryan made the point that we have a Marine detail guarding the ambassador in Paris; how is it possible to assume that an ambassador in LIBYA doesn’t need heavy security? Biden brought up that Ryan supposedly voted for a bill that cut embassy security like that needed in Libya (though, I thought they didn’t “need it”? ), yet the measures Ryan supported to cut back on the budget had zero to do with embassy security funding. -This administration spent weeks and thousands of dollars running around apologizing for this “video” that they said sparked the “spontaneous” protests in the Middle East. While we now know that the intelligence community (which Biden threw under the bus tonight) made it possible for the White House to know within 24 hours that this attack was deliberate, this administration (Biden included) sent people out to talk shows to make the claim; sent the President to the UN General Assembly to gravel about the video once again, and this administration spent $70,000 on ads in Pakistan apologizing for the video itself. Iran: Interestingly enough, Biden blamed Intelligence for the initially “false” information tying the Libyan attack to the the “anti Muslim” video, yet adamantly insisted that the administration “would absolutely know” if Iran was getting close to a nuclear weapon. Ryan made it clear that we must not project weakness, while Biden claimed that the sanctions levied against Iran are the most hard-hitting in history. Biden also told us all we need to “calm down a bit” when it comes to the Iranian discussion. Classy. And utterly unintelligent. -Why is it then, Mr. Vice President, that in 4 years Iran has gotten exponentially closer to nuclear capabilities? Israel: Biden referred to Prime Minister Benjamin Netanyahu in a nationally televised vice presidential debate as “Bibi.” Enough said. Military: Biden said that the military members themselves have told the administration that they need a smaller, leaner military. I guess somebody forgot to tell him that his boss authorized an Iraq-like surge in Afghanistan. I guess you don’t need a big, buff, military to win wars theses days. While Biden stated at least three or four times that we are OUT in 2014, Ryan made it clear that we cannot sit here and advertise our pull-out date to our enemies; that we might as well tell them to mark it on the calendar! By the way- Biden claimed he voted against both the Iraq and Afghanistan wars- yet Congressional records state otherwise. Darn those facts. Gotta love people with the guts to spew a bold-face lie on live TV. Unemployment: I must say, in a nation with a U-6 unemployment rate of over 14.6% staring us in the face, this moderator spent a shamefully little amount of time on it. Biden tried to tout the recently released lower rate of 7.8% (though, as I’ve detailed, it’s a dishonest measurement of the true unemployment rate) and Ryan simply looked at Biden and asked him what the unemployment rate in his hometown of Scranton was in 2008 versus now- 8.5% vs. 10% in 2012. Ryan pointed out aptly that Obama/Biden had the Congress for 2 years without Republican opposition; that is, that they could have done anything and everything that they wanted to do to get this country out of the whole, and yet here we still sit. Personal Finance: Ryan made an excellent point that Romney’s given more to charity than himself and Joe Biden combined. Biden responded with how he doesn’t doubt Romney’s personal generosity….though he’s not afraid to insinuate he’s a heartless gazillionaire on the campaign trail? Medicare/Obamacare: While Biden tried to once again paint Ryan as a grandma-killing ogre for wanting to reform Medicare with a system of true choice, Ryan simply stated that he and Governor Romney would rather see millions of American seniors with a choice (rather than an empty Medicare coffer) than a panel of 15 un-elected officials mandating the medical choices of these millions. Biden whined that he already had to discuss “death panels” once before when he debated Governor Sarah Palin, which would have been a bit hard to do considering Obamacare wasn’t even yet passed. Whoops. Oh and by the way- Biden, who just got finished saying his faith defines him, chose to ultimately use the Lord’s name in vain as he closed his statements. Classy. Last but not least, our dear moderator. Someone I saw on Twitter put it so well: “I’m going to go out on a limb and say that this moderator does not have a Romney/Ryan bumper sticker on her Prius.” While Biden whined about having less time, it couldn’t have been clearer who Ms. Raddatz was trying to help. She went after Ryan time and time again, allowed Biden to interrupt at every chance, and cut Ryan off whenever she could. Ryan was right on issues. We’re spending too much, and trying to fix it with taxes. We’re projecting weakness around the world, and apologizing for the values and principles that made us great. As a result we are fledgling as a once great economy, and are horribly vulnerable in the face of terror that wants to seem our demise. Ryan ended the debate by telling Vice President that it was an honor to have had a chance to debate it. Biden spent more time telling people why to vote AGAINST the other guy rather than encouraging people to vote FOR something. If anybody came to this debate hoping to learn substantially about the Obama/Biden position, you’re out of luck. So why do I think Ryan could have done far better? Ryan allowed himself to be cut off. To be interrupted. To defer to Biden. Part of me wonders if this was just Ryan’s quintessential respectful character; part of me wonders if Biden’s horrendous rudeness caught him off guard. Either way, the Vice President acted in a way unbecoming to the office he holds, and unbecoming of a public servant. It was rude and condescending, and distracting from the real issues facing Americans today. Ryan should have gone after him like a hawk- all the while staying on point- but reprimanding the Vice President for his utter lack of respect on that stage. Tomorrow morning, the papers are likely to sing victory for Biden. 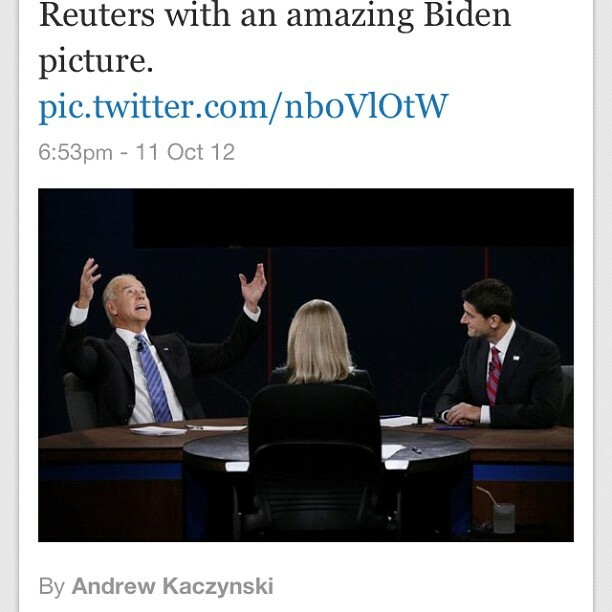 I’d guess the blogosphere is already doing it- and frankly, it wasn’t that Biden was particularly THAT GOOD. I just think he was THAT RUDE- which I have no doubt the mainstream media will construe as “strong.” Mark my words. Policy aside- strategy aside- who looked more presidential? Thank God for your blogg. I was a little down as my better half had to go to bed to get up early tommorrow. So I had no one to discuss it with. You lifted my spirits and I agree with you totally! Thank you for your thoughtful comments. I could not see the debate, so your remarks were very helpful. Turns out, from Drudge, you were right on about Biden. Thank you for the time you spent last night putting your report together, so that I could get to it at 4:30am. You are a Blessing. I’m so glad you liked it! I was telling Bev that I almost didn’t write it (that is, that I almost waited till this morning) but I felt compelled to write it last night. Like I told Bev, we can be comforted in the fact that Paul Ryan acted with honor and respect, and Joe Biden made a fool of himself, and a lot of people are taking notice!